Neigetsu is a Japanese Calligraphic Designer and Artist, born in Tokyo, Japan in 1982. She began learning Japanese calligraphy at the age of 6. Neigetsu received a Bachelor of Education from the University of Tokyo. She attained the rank of Shihan in 2008, certifying her as an instructor of Japanese calligraphy. Her artwork goes beyond creations of Japanese modern design and art. As a teacher, she creates curriculum content to increase creativity in her students. Neigetsu’s second solo exhibition will be held from February 24th to March 31st at a stylish cafe located in the Shibuya district of Tokyo. She writes, “For this exhibition, I created and wrote a “One Hundred Character Poem” with advice from a Chinese friend. 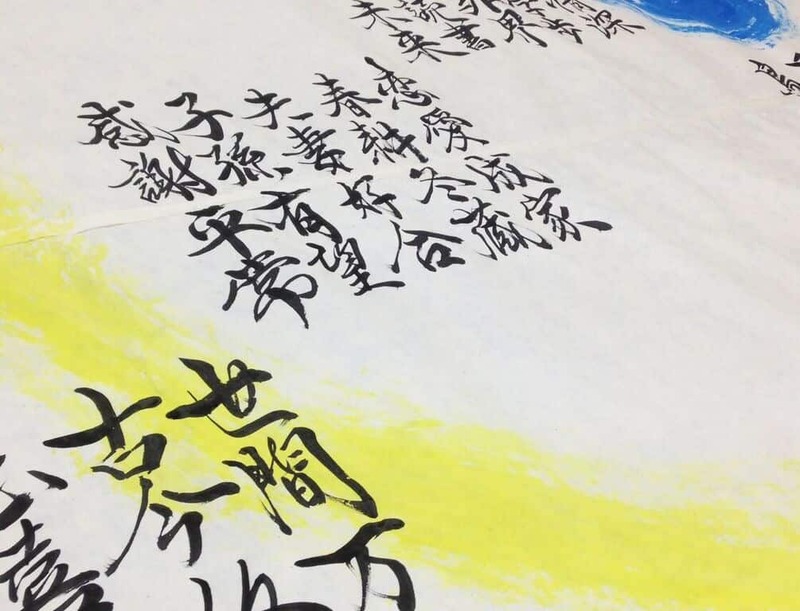 You might know the “Thousand Character Poem Classic”, the very old famous Chinese poem which all students of calligraphy must learn when they begin their studies. The “One Hundred Character Poem” was created by extracting the essence of Asian ideas from the “Thousand Character Poem Classic”. At the same time, I added the feelings of our generation using only one hundred Chinese characters, each one different than the rest. 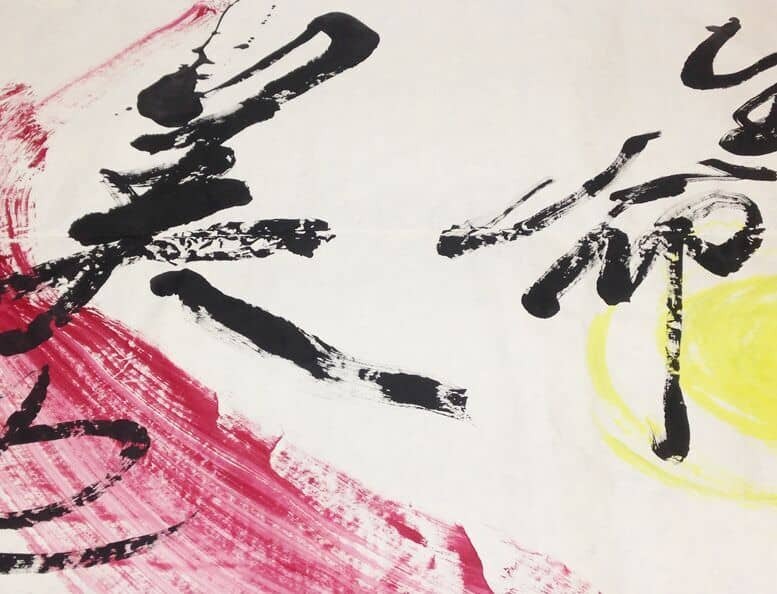 The title of this exhibition is “A One Hundred Character Poem – Life is Beautiful”, an original poem brushed in Japanese calligraphy. The artwork was composed and written by me. “A One Hundred Character Poem” is very simple. It consists of one hundred Chinese characters, each one different. The idea of creating this poem was conceived two years ago by me when I read a book about “The Thousand Character Poem Classic ” at a coffee shop near my home. Below is a translation in Japanese and in English of the poem you will see in calligraphy. （てんたかく　くもとぶ） Heaven is high, clouds floating. （ちはひろく　みずはとこしへに） Earth is grand, water flows forever. （ひはとうかいにいで） Sun rises over the east sea. （つきはせいざんにおつ） Moon goes down to the west mountains. （とりはかたり　はなはかんばしい） Birds are singing as flowers smell sweet. （いつくしむはは　じょうふかし） The love of tender mothers is deep like ocean. （たのしくそだち　がくはあゆむ） Children grow up happily, learning as they walk. （がいかいをたんゆうす） Play and search the outside world. （ともとまじわり　しょをよむ） Build friendship while they read books together. （わらいてみらいをだんず） Always laughing by talking about the future. （れんあいして　いえをなし） Young loves change up to the family. （はるにたがやし　ふゆにおさむ） Cultivate in spring, store crops in winter. （ふさいこうごう） Husband and wife care each other. （しそんにのぞみあり） Give hopes to their descendant. （へいじょうにかんしゃす） Say “thank you” to every peaceful day. （ここんしゅうし） Has its start and the end in any era. （ひきりんてん） Joy and sorrow round and repeat. （ゆくものかくのごとし） People pass away in the same way. （ときはわれをまたず） Time goes by without waiting for me. （こうふくはいずこにありや） Where and what is the “happiness”? （ふうこうはむげんにして） Wind and light has the infinite power. （生命は美なり） The life is nothing but beautiful. composed by Tian Shan and Neigetsu calligraphed by Neigetsu. Please note that the cafe is closed Mondays and the first Tuesday of the month. ← What is Kana Ryoshi? Very creative approach to the Thousand Word Classic – I enjoyed this much! Thanks, Rona, for sharing Neigetsu’s inspired interpretation! Thank you for your comment. I am glad to know you enjoyed my work so much. I love Thousand Character Poem Classic and hope I could convey its thoughts to more people in the world by creating this modern poem. Thank you. Rona Conti-san: Thank you for sharing this very useful set of four character phrases. I am so glad that you were able to set the four character phrases side by side their readings in Japanese and meanings in English. 世間万物 世間万物（せけんばんぶつ） Everything in the world. Another phrase with the similar meaning, 有象無象 [ウゾウムゾウ] この世の中にある有形無形のすべてのもの. Kusaba-san, Thank you for your comment. I got impressed by your knowledge for Chinese words and poems. In this “One Hundred Character Poems”, we chose one hundred characters each different than the rest. “有象無象” is the same meaning but we can not use it in this poem for that reason. This kind of discussion is really interesting. Thank you so much. This work is so ethereal and breathtaking. I loved going over and visiting her beautiful website, too. I hope you follow up with even more pictures, particularly of the exhibition. This article is so inspiring! I was really pleased to find your comment. Thank you for visiting my website, too. My exhibition has started since this Wednesday. I will share the photos and the movie sometime in the near future. I would appreciate if you checked them. ..simply beyond calligraphy, and simply beyond beautiful as well! thank you so much for such a very lovely post.. Your words impressed me so much. I am pleased if many people feel something beyond calligraphy and beyond beautiful from this artwork. I am planning to post much more photos and so on. I appreciate if you look forward to seeing them. Lovely, I liked it, thanks Neigetsu. I could learnt Japanese through the thousand word classic. Thank you so much, Judy. I am pleased to know you learnt Japanese through the thousand word classic. I hope many people will love this classic in the future too. It was one reason why I decided to make One Hundred version. I’d like so much to visit your exhibition, too bad I’ve been in Tokyo last year in April and I was looking unsuccessfully for calligraphy exhibition. I just found small one in Kyoto. I start to learn calligraphy for one year in Paris and the first model my French sensei gave is The Thousand Characters Poem written by Chinese Master Yu Yu Ren. I still go on and have happiness to do that. Good luck and have good time for your exhibition.